This is the first direct visual evidence that black holes exist, the researchers said. In the image, a central dark region is encapsulated by a ring of light that looks brighter on one side.The massive galaxy, called Messier 87 or M87, is near the Virgo galaxy cluster 55 million light-years from Earth. The supermassive black hole has a mass that is 6.5 billion times that of our sun. "We have seen what we thought was unseeable," said Sheperd Doeleman, director of the Event Horizon Telescope Collaboration. "We have seen and taken a picture of a black hole." 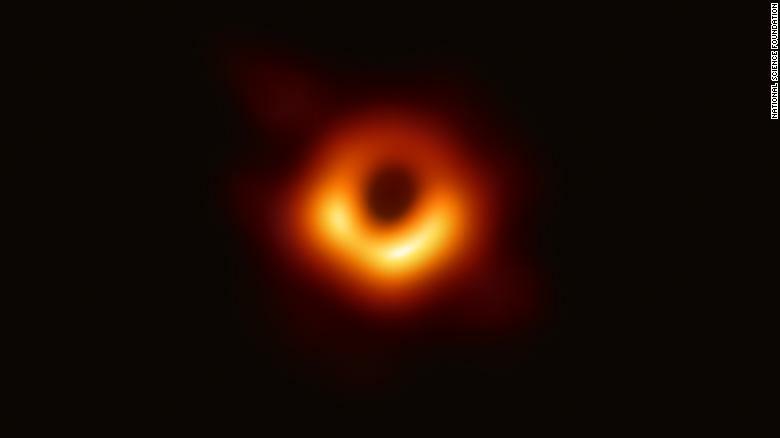 "If immersed in a bright region, like a disc of glowing gas, we expect a black hole to create a dark region similar to a shadow -- something predicted by Einstein's general relativity that we've never seen before," said Heino Falcke, chair of the EHT Science Council. "This shadow, caused by the gravitational bending and capture of light by the event horizon, reveals a lot about the nature of these fascinating objects and allowed us to measure the enormous mass of M87's black hole." The visual confirmation of black holes acts as confirmation of Albert Einstein's theory of general relativity. In the theory, Einstein predicted that dense, compact regions of space would have such intense gravity that nothing could escape them. But if heated materials in the form of plasma surround the black hole and emit light, the event horizon could be visible. "Once we were sure we had imaged the shadow, we could compare our observations to extensive computer models that include the physics of warped space, superheated matter and strong magnetic fields. Many of the features of the observed image match our theoretical understanding surprisingly well," said Paul T.P. Ho, EHT Board member and director of the East Asian Observatory. "This makes us confident about the interpretation of our observations, including our estimation of the black hole's mass." M87's black hole has an enormous mass, which gave researchers reason to believe it may be the largest viewable black hole from Earth. Relative to other objects, supermassive black holes are actually small. This is why they couldn't be observed before. Black hole size is directly related to mass. The larger the black hole, the larger the shadow. And black holes may seem invisible, but the way they interact with the material around them is the giveaway, the researchers said.